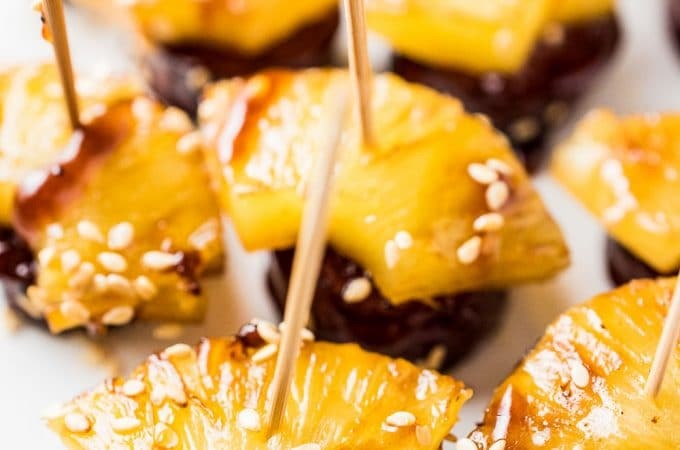 These super delicious Pineapple Sausage Bites are an easy to make appetizer perfect for your party. 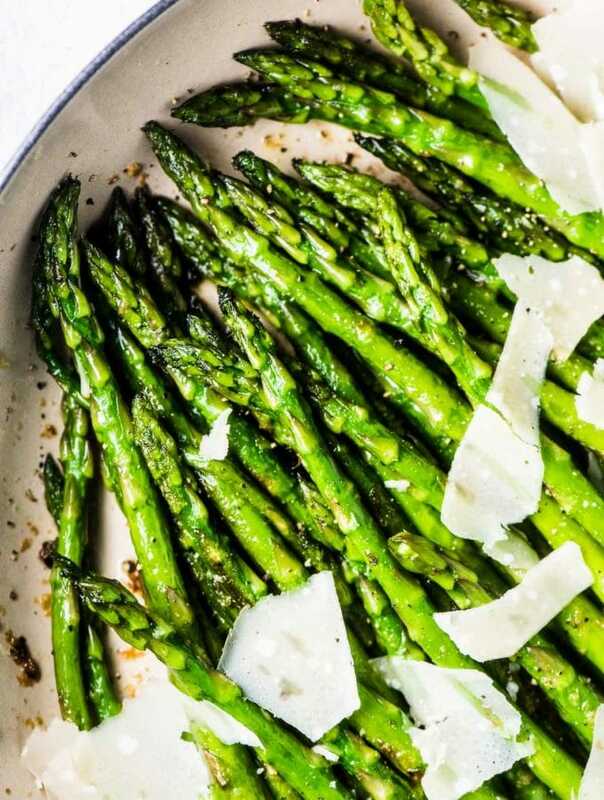 Keep it simple and serve them in a bowl or get fancy and skewer them on toothpicks. Either way, your guests will LOVE these! 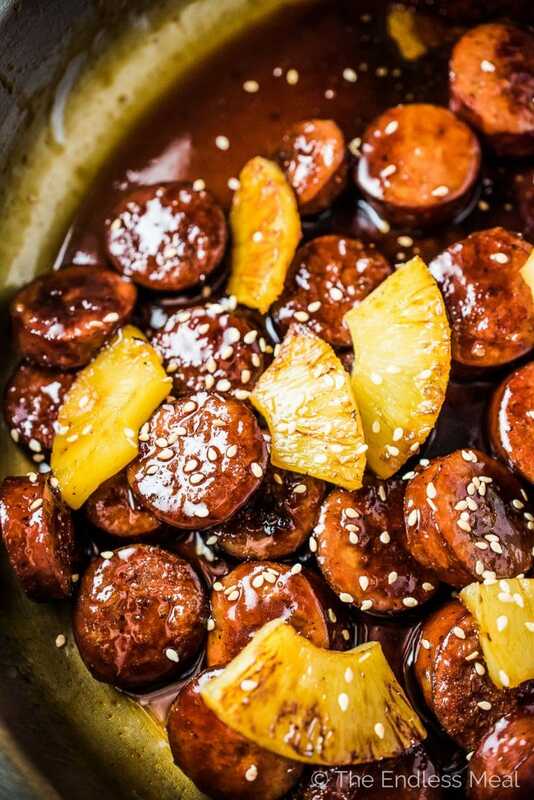 The sweet pineapple, the flavorful sausage, and the sesame glaze with just the right amount of spice is vying for the Best Appy Ever Award. We all need a pretty appetizer recipe that is easy to make but makes us look like kitchen stars. Having a few gluten-free appetizers is a must at parties these days. 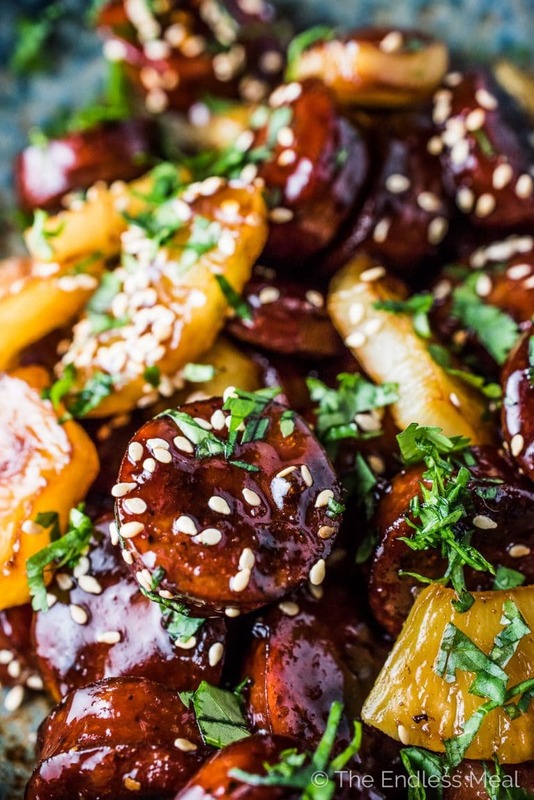 These Pineapple Sausage Bites are also dairy-free and paleo so you'll be covering your bases with your healthy eating friends. 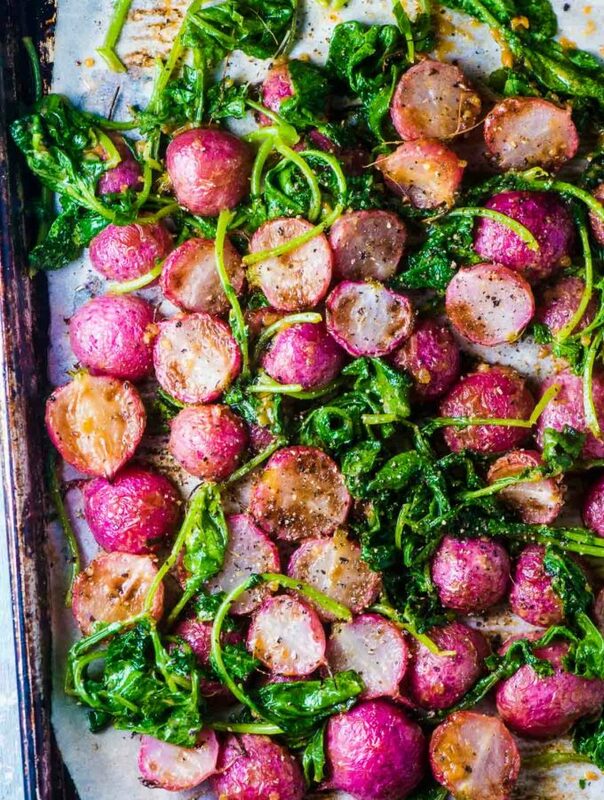 Easter is just around the corner and Easter dinners need appetizers. So does Easter brunch, IMO. After Easter is Mother's Day and after that are bridal shower and baby showers and all the fun summer parties that deserve an equally fun appy. PS. I'm co-hosting a giveaway with Grimm's Fine Foods. Make sure to enter just above the recipe! Did you see that transformation? 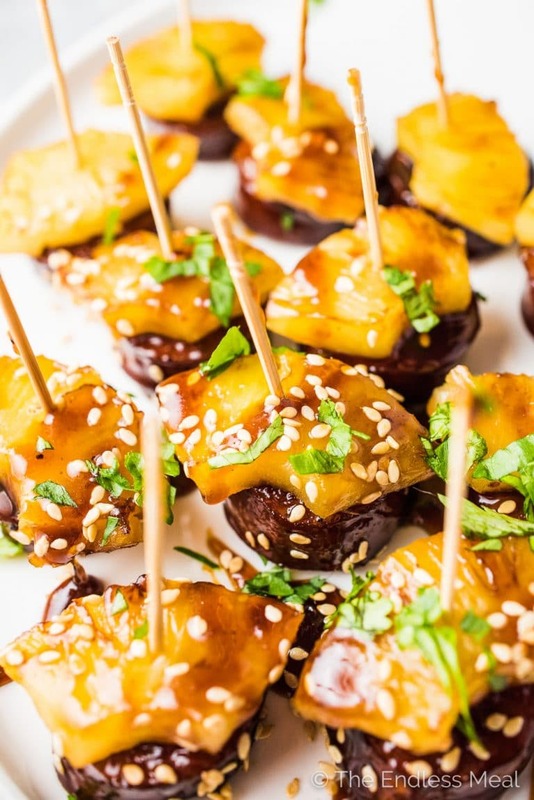 Sesame Pineapple Sausage Bites on sticks to Sesame Pineapple Sausage Bites in a bowl … Bam! So easy! I really wanted to be able to tell you guys that I like them (____) way, but I can't choose a favorite. It totally depends on the party/ how I'm feeling. 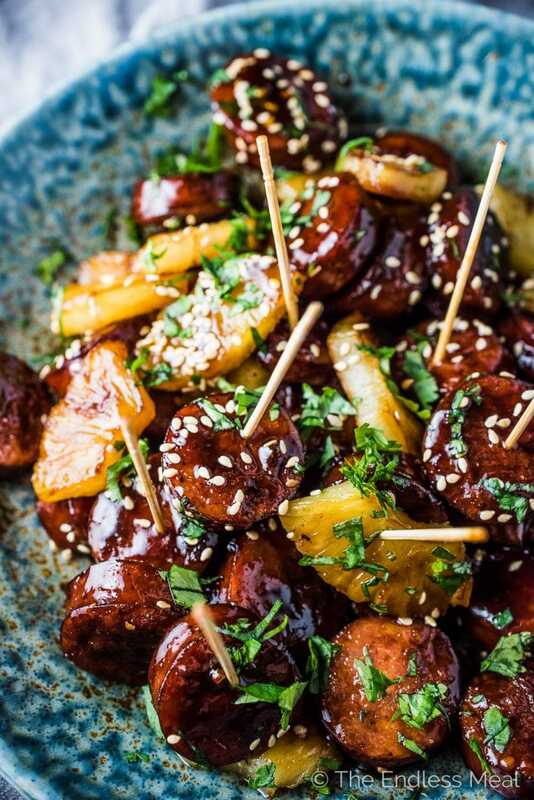 I mean, bite-sized party food on sticks is always fun, but a bowl of sesame glazed sausage bites with caramelized pineapples is super awesome, too. The sausage I've used in this recipe is Grimm's Fine Foods Polish Sausage. Have you tried it? It's a naturally smoked sausage that works perfectly in these appetizer bites. It's also gluten-free, lactose-free, soy free, and has no MSG added. Awesome all around. If you can't find their Polish Sausage, they also make a Mennonite-Style Farmer Sausage and Fine Garlic Sausage that are delicious. I buy Grimm's products quite often and have loved all that I have tried. When I was doing The Whole30 Program their breakfast sausages saved me. It's so hard to find compliant breakfast sausage! You might remember I used it in the Egg and Sausage Stuffed Peppers recipe I shared a while ago. Their chorizo is something I keep on hand nearly all the time. Have a look for it next time you're shopping at IGA! They are about as easy to make as SAYING pie. → Slice the Polish Sausage and brown it in your biggest frying pan. → Make a quick sauce with the juice from the can of pineapples. → Put the pineapple slices in the pan for a couple of minutes so they get a nice caramelized color. 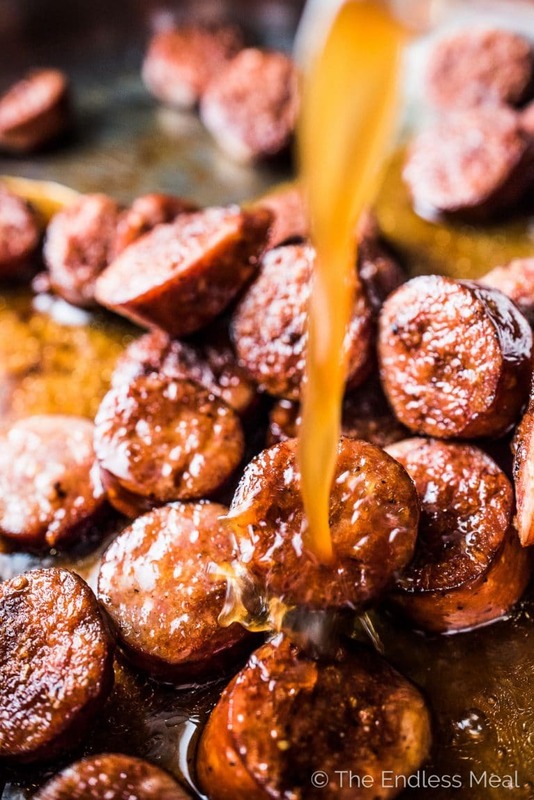 → Pour the sauce into the pan and let it bubble away until it is syrupy and coats the sausages in a tasty glaze. 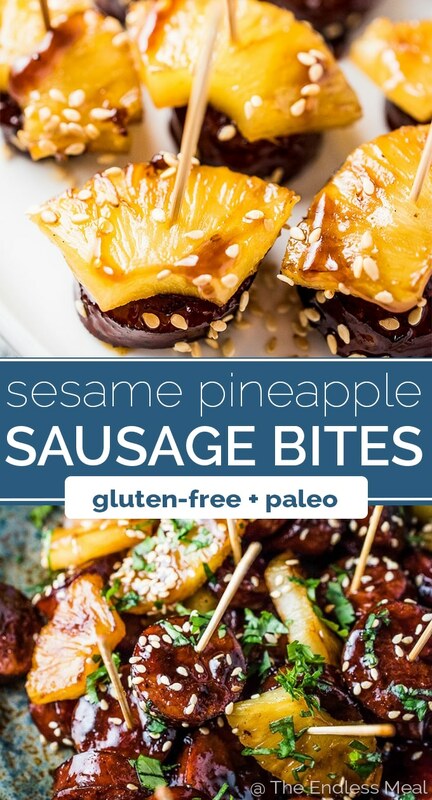 → Either serve the pineapple sausage bites in a bowl or get fancy and skewer a piece of pineapple and a piece of sausage on a toothpick. That's it! See how easy that was? Sesame Pineapple Sausage Bites for the win! Grimm's Fine Foods Easter Giveaway! Grimm's has offered to give one lucky winner a $100 prize pack full of their products, including the Polish Sausage so you can make these Sesame Pineapple Sausage Bites! Increase your chances of winning by entering up to seven times by following both our Instagram and Facebook accounts, tweeting a message, pinning an image, and leaving a comment on this post. These super delicious Pineapple Sausage Bites are a simple and easy to make appetizer perfect for your party. Keep it simple and serve them in a bowl or get fancy and skewer them on toothpicks. Either way, your guests will LOVE these! Heat the oil in a large frying pan over medium-high heat. Add the Grimm's Fine Foods Polish Sausage and cook, stirring the sausage bites occasionally, until they are brown on both sides, about 10 minutes. Remove the sausage bites from the pan. While the sausages are cooking, prepare the glaze. Drain the pineapple juice from the can into a small bowl. Whisk in the honey, sesame oil, balsamic vinegar, soy sauce, and (if using) the sriracha. Cut the pineapple rings into quarters. When sausage bites come out of the pan put the pineapple in. Cook the pineapple pieces for 3-4 minutes on each side, or until they are lightly browned and starting to caramelize. Remove the pineapple from the pan. Put the sausages back into the pan and pour in the glaze. Bring the pan to a boil and boil rapidly until the glaze thickens enough to coat the sausage bites, about 3-4 minutes. Either add the pineapple pieces back into the pan, toss gently, then transfer the sausage bites and pineapple to a bowl to serve OR skewer one piece of pineapple and one sausage bite on a toothpick and plate on a platter. Sprinkle some sesame seeds and a little cilantro on top and serve right away. 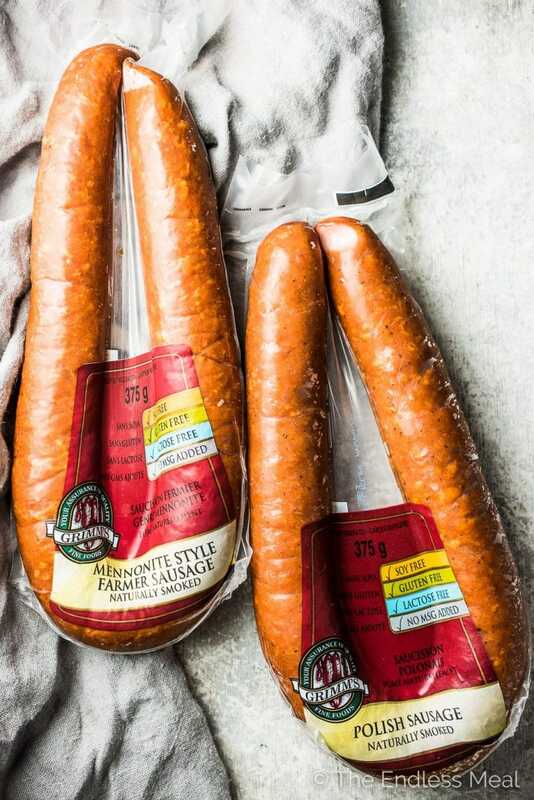 Other great options for this recipe are Grimm's Fine Foods' Fine Garlic Sausage and their Mennonite Style Farmer Sausage. Hi! I don’t believe Grimm;s is sold at a store near me. Is there another sausage you can recommend that would go well with this appetizer? I love sausage stuffed mushrooms and you can never go wrong with a meat and cheese platter. Those sound amazing! I bet Grimm’s breakfast sausage would be great stuffed in mushrooms! Toothpick appies are the best, aren’t they?! We make a wonderful hot bacon & cheese dip in a breadbowl which is amazing! That’s what I’m making for dinner tonight! Mmmm sweet and sour meatballs! That is like asking me to choose a favorite grandchild! All are loved for something special, but have to admit, at last night’s party … where we all brought appies and had a huge buffet of them .. I kept going back to the guacamole, 3 layer dip with scoopers. Oh, and also the korean pork and the mushroom puffs. 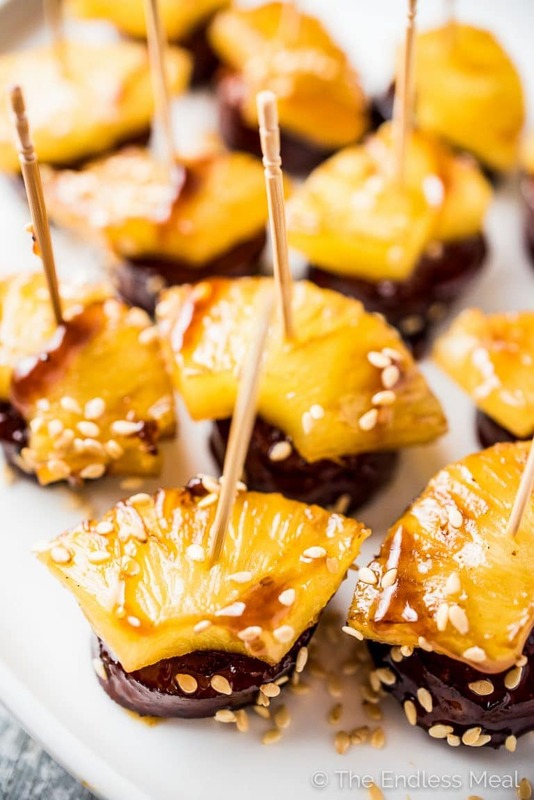 can’t wait to try the pineapple sausage bites to be the ‘star of the show’ at our next gathering! Hahahah I totally know what you mean! Choosing just one favorite is so hard! I love Grimms meats, and the only gluten free that I buy. 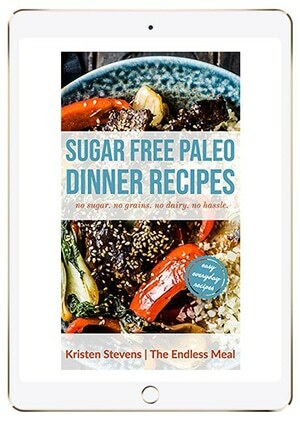 Great recipes to try. I’m so happy to hear that you like them, too! We love Grimm’s!! Sausage rolls and chicken wings but now likely to be these ! ? Yum! Pineapple ? I hope these take over the number 1 spot!! My favorite party appetizers are mushroom tarts. They are so delicious! I love a good charcuterie board! Always so good! I love to add Grimm’s garlic sausage to my charcuterie boards. I like pizza rolls and spinach dip with bread and veggies. Yum! My favourite party appitizers is deviled eggs and meatballs. Devilled eggs are always so good! We love chicken wigs and meatballs for appetizers. Chicken wings are always so good! Haha I’m so with you there girl! Love your idea about serving hummus with grilled veggies. yum! My favorite appetizer is garlic chicken wings! I like making hot cheese dips as well as platters with cheese, sausages, crackers, and veggies for appetizers. Hot cheese dips are so good! Bacon wrapped jalapeno poppers have always been a fave of mine! I love making taco meatballs. chicken wings are always a crowd favorite! I love chicken wings too! Such a great classic combo! My favorite party appetizer is a relish plate or meat and cheese plate. There are so many great ones it’s hard to choose just one!! Choosing favorites is always so hard, isn’t it?! It’s always been a cheese and fruit platter but this might be my new fave! I’m crossing my fingers these will be your new fav! I love honey garlic meatballs but if I have the time I like to make spring rolls. My favourite party appetizer are mini spring rolls! I love spring rolls too!